Perhaps the most disturbing thing about this image is that the dog's genetalia has been carefully shaved and groomed. 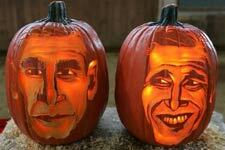 Perhaps the most disturbing thing about this image is that the pumpkin actually has a higher IQ than Georgie. Perhaps the most disturbing thing about this image is that Marilyn's lips are bigger than Angelina Jolie's. <mypalmike> I believe that all these pics somehow involve shaved genitalia.